DIM Weight is short for dimensional weight – it’s a billing method that uses the total volume of a package (length x width x height) to calculate freight costs instead of using the actual weight of the package. When dimensional weight is used, shipping costs are based on the higher of the two measurements: package weight or package size. In 2015, UPS, DHL and FedEx all announced that dimensional (DIM) weight pricing would go into effect for all ground packages – regardless of size. The reason for this change in billing is due to the growing number of e-commerce packages that are not being packed in ways that save space. Have you ever gotten a box delivered to your home that contained one small item and a huge amount of air pillows or paper cushioning? Shipping packages that are large and light can fill up a delivery truck long before any weight limitations are hit, and this costs the carrier money. What does that pricing increase really look like? Check out these examples of common products sold through e-commerce. Calculations based on 2017 UPS Shipping Rates for Ground service. Surcharges not included. As you can see, the difference between actual (cubic size) and dimensional weight significantly increases your freight bill over time. 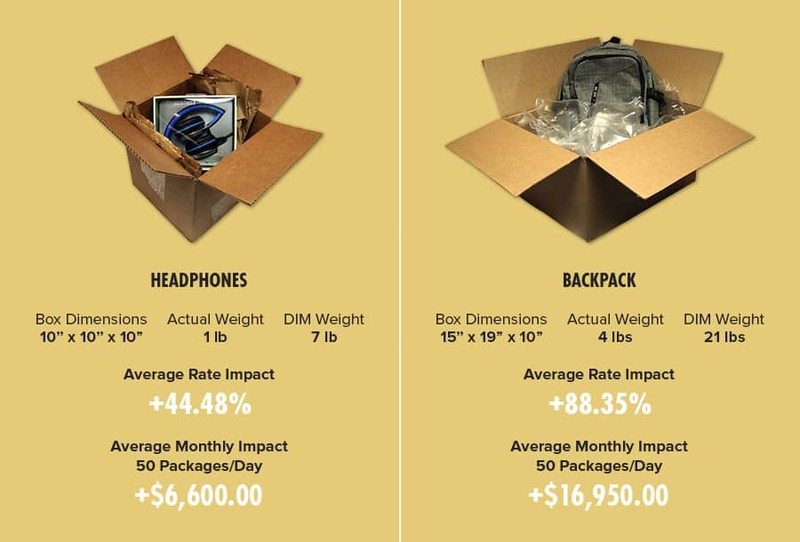 Many companies are negotiating a special divisor rate with the shipping companies, but don’t stop there… you can reduce your freight bill even more by right-sizing your packaging! IS DIMENSIONAL WEIGHT IMPACTING YOUR BOTTOM LINE? Don’t leave yourself at the mercy of the shipping companies. Let us right-size your packages and reduce your freight bill, contact us today!